We are grassroots organizers that formed three years ago in Florida. Some of us were and still are members on an email list called Spectrabusters. We have been working to inform citizens and alert corporate media about this pipeline since 2013. We united and formed the social networks with the original Facebook Group STOP SABAL TRAIL PIPELINE created by Anita Stewart in April of 2014. 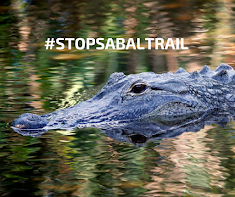 We also created and started using the #StopSabalTrail hashtag. Our mission is to #StopSabalTrail pipeline, a fracked gas pipeline that will threaten the lands, waters (including aquifers, watersheds, rivers, springs, ponds, wetlands), our environment and flora & fauna in three states. Over 160 eminent domain lawsuits have been filed. Citizens' properties are being seized to complete this project. Most of the people that live closest to the pipeline are not even aware that it is being installed. Fracked Gas (or methane) would be transported on commuter trains and the entire system will consist of staging areas, compressor stations and areas to process and export the product. One of the plants is dangerously close to a nuclear power plant. This puts lives in danger. The human impact cannot even be estimated at this time and could occur from mistakes such as work hazards, derailments and possible explosions. We don't have much time, perhaps weeks as Sabal Trail under Spectra and other parent Big Oil and Gas companies have already broken ground in three states: Alabama, Georgia and Florida. The pipes are being installed rapidly and in multiple locations throughout the three states right now. This pipeline is expected to be operational by June of 2017. This pipeline is just one portion of a much larger infrastructure of over 44 pipelines either being constructed now or in the planning stages all over the continent of North America. It is important to note that this pipeline has been APPROVED. There is no more asking nicely from elected representatives. They can't help us. We need to move forward in an attempt to save our future. We all want the same things for our families. Clean lands, pure water and air, properties untainted by chemicals or gasses, an ability to farm, safety for our children, animals, plants and endangered species so they can all thrive. We want to leave the beauty of this region even better for the next generations.